This past week Randy and I took a trip to Austin. With it being known for its musical flare, Randy commented that he felt "like we should see a show or something", but we hadn't really planned anything like that and didn't really feel like hunting something down that may or may not be lame. Still, we talked about it for a little while because we felt like we should simply because it would be cool or might make a good story. We didn't want to come up short when comparing ourselves with other people. All in all, though, we took the trip to get away, do whatever we felt like, when we felt like and just be together for relatively cheap. So, that's what we did. But that tendency to compare yourself with everybody else or the imaginary "they" and "them" is a much bigger force in my life than #1 I ever used to realize and #2 is healthy for a whole group of people, much less little ol' me. Comparison is human and productive in learning. 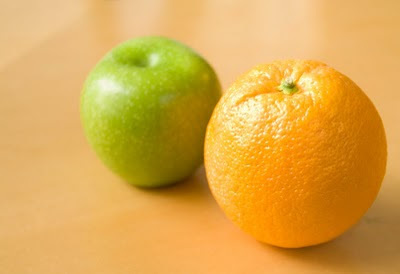 How is the apple different from the orange? How would the story change if Cinderella was a CEO and not interested in settling down? Comparing isn't bad, but comparing yourself with the constant question, "Am I as good as my best friend or cooler than this random person I've never met?" is treading on dangerous ground. Friends and peers can be motivating to be better, but for me it always left me despising myself. I guess I was looking for some one or some group that was just like me so that then I could be acceptable or just as good as because they would be just like me. I'm not about to finish up with a we are all different, what would the world be like if everyone was just like you speech, because that never really helped me NOT compare myself. Instead, I'd like to talk about permission. For whatever cooky reason, I think I've needed permission to do what I want, regardless of what custom or the group says is acceptable. The group, the customs are rarely dictating what is the healthiest option for your life. And I never really understood that until recently. Whatever it is driving a new car rather than a dependable used one, going into debt because you get something cool rather than paying cash and knowing you aren't in debt for the next 12 years, saying yes to every good thing there is to do in the world rather than choosing some and still meet all of your family obligations, or chasing down some music scene just b/c someone else might think its cool rather than making personal gains with your best friend, comparing your life with anyone else just wastes time and stifles growth. Take it from one who had every opportunity to grow a lot more a long time ago but didn't because she 'wasn't already as good as so-and-so', it's just not worth it.